The Cactus Garden (Jardín de Cactus) is located at the northern end of Guatiza, on the eastern side of the LZ-1 road that leads to Mala – not to be confused with the new by-pass that goes around both towns. 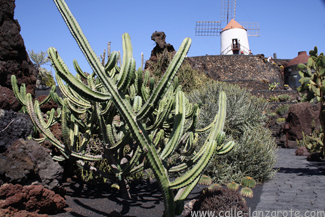 The garden was designed by César Manrique and opened in 1990 (according to the official Spanish guidebook. Many sources quote 1991) and as such was the last of Manrique’s “centres” to open. Inside there are over 1,000 different species of cacti. Some of them are indigenous to the island, but many come from as far away as South America.